Outlook add-ins that improve your email routine! Use the Bells & Whistles Outlook add-in to save time and become more productive by automating email message greetings, repetitive text blocks, email format options and many other Outlook email properties and actions. Discover your business email behaviour using the extensive Bells & Whistles email statistics tool for Outlook. And you can easily manage all your other Outlook add-ins using its free Outlook Add-ins Utility! Email Address Collector lets you extract email addresses from dozens of email address sources, such as Outlook, Outlook Express or Thunderbird email folders, Exchange address books or Outlook Contact folders, PDF documents, Microsoft Office files and so on. Using advanced filtering options, you can precisely extract only those email addresses that you are looking for. 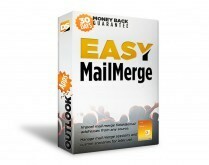 Easy Mail Merge helps you reach your audience and increase your email marketing success rate by personalizing, scheduling and sending mass emails right from within the Outlook interface. You can also track your email open and click-through rates! 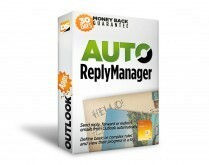 Auto Reply Manager transforms your Outlook mailbox into a fully automated email answering machine by allowing you to automatically reply, forward, redirect or resend emails based on your own rules. The Auto Follow Up Outlook add-in helps you stay on top of important email conversations by automatically sending follow up emails to your contacts if they don’t reply in a timely manner on selected emails. And you can setup recurring emails to be sent at any time period! 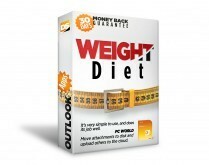 Weight Diet is an Outlook add-in designed to clean up & optimize your Outlook mail folders and data files, remove obsolete and duplicate emails and make Outlook run faster. All our Outlook add-ins are designed for the Windows versions (XP, Vista, 7, 8 or 10) of Microsoft Office Outlook 2007, 2010, 2013, 2016, 2019 (x32 and x64) & Office 365. Add-ins are not supported by Outlook for Office Web App and Outlook.com web interface.